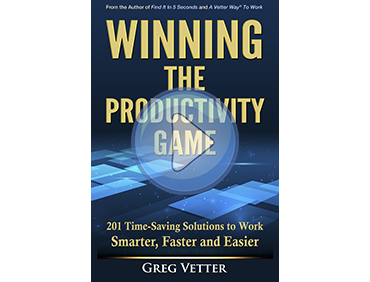 Executive Focus Coaching | Vetter Productivity, Inc. Many executives spend their time on wrong activities. Why? Because they have never taken the time to really focus on what they need to be working on. How much time do you spend on tasks that could be delegated? How much time do you spend working on computer tasks that an assistant could be doing? Are you really spending your time on that one activity that will drive your organization to success? Imagine having your own personal coach to assist you in staying totally focused on that one activity that you really need to be doing. What would it be like to have a personal guide who could give you honest insight, free of cultural bias, allowing you to experience breakthrough after breakthrough and enabling you to move to the next level of productivity? Focus coaching is getting absolutely and positively clear on that single activity that will produce the most results for you. Feeling as if you aren’t spending your time as wisely as you could. Never quite having or making the time to focus on your really key issues. Reacting to day-to-day situations rather than spending time on your big picture. A priority system that doesn’t quite work for you. Ready to take your organization to the next level. For the first time in your life, really know and do what you need to be doing. Learn a simple method of focusing that you can use for the rest of your life. Be more focused than you ever have been. Learn what gets in the way of you being totally successful. 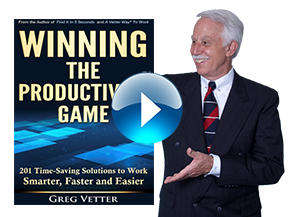 Eliminate hours of unproductive and unnecessary work. To keep you on track and focused. You want to get to the next level of productivity with your job but you’re not totally sure how. To have someone act as a sounding board when you need to talk with or bounce ideas off someone. Increase your work output and daily performance. What your key activity is. The activities that net you the biggest results. What you do best and worst at work. What you do that can be done by someone else, that you continue to do. Systems, processes and ways to be more effective and efficient. Recently the Vice-president of an Atlanta-based company admitted he wasn’t allocating time to plan the future of his company. When asked exactly how much time he was spending, he huffed, “I don’t have any time for that.” Fortunately, the executive made this admission during an Executive Focus Coaching session with Greg, who quickly set about exploring the underlying psychological issues that were keeping him from taking the time to think ahead. With Greg’s insight, the Vice-president became clear as to what he needed to do in order to obtain maximum results. Sessions are private and confidential.